SYZYGY MISSIONS SUPPORT NETWORK » Why retire at all? » Why retire at all? 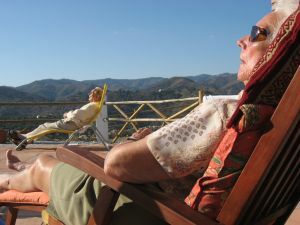 Retirement is a fairly modern concept in the history of humanity, though for some rich people there may always have been the idea of slowing down as your body ages and living off accumulated wealth. Most working people would have carried on working till they died, although their role may have changed as they became less able to do the hard physical work they could when they were young. There’s little indication of retirement in the Bible (other than for priests and Levites) and the idea would have been completely anathema to someone like Paul, who wrote “… I am under compulsion, for woe is me if I do not preach the gospel!” (1 Corinthians 10:16). It is indeed hard to imagine Paul putting his feet up, taking up golf, and playing with the grandchildren. I admire the elderly mission worker I met in Mozambique who said that when he reached 75 he asked God to give him another ten years to preach the gospel! So when we reach the age when our secular friends are thinking of retiring from a job they hate but have taken just to save up enough money to live the life they want to when they retire, what are we to do? Surely we do what we do because we have a passion and a calling? Aren’t we already living the life we want to? So we don’t assume we have to retire if we don’t want to. Some of us may choose to retire for positive reasons such as spending more time with family and helping to raise grandchildren. There are others among us who may feel we need to be closer to family as our health deteriorates. Some of us may find our visas rescinded and take the opportunity to come ‘home’. Others may run out of money. Or we may be with agencies that encourage us to retire, though in UK as in many other countries, this is now usually illegal under discrimination legislation, though some exceptions still apply. Barring such external circumstances, there is no reason why we cannot continue in active overseas ministry for the rest of our lives. Yet reaching a significant age, such as 60, may prompt us to take stock of our lives and ask God what he wants us to do with our remaining years, and how and where God wants us to serve. The righteous… will still bear fruit in old age, and they will stay fresh and green.